Non-Essential Employees – Who Makes That Call? Like most Americans, I’ve been following the circus in Washington this week, and hoping that the boys and girls in Congress will find a way to work together to find a constructive resolution to our current government shutdown. About 800,000 federal employees (out of 2.2 million) are on unpaid furloughs. Whether they’ll be successful in recovering these wages when their furloughs end is an open question. The federal employees allowed to stay on the job may experience delays in getting paid when the furloughs end. In the meantime, I am fascinated by the question of who determines who are the “non-essential” employees who get the short end of this deal. This chart from the New York Times provides a high level view of who keeps working (and getting paid) and who’s at home (and worried about making the mortgage payment). According to the NYT article linked to this chart, “Each cabinet-level department and federal agency was required to identify essential personnel and determine which operations would continue..”. You can find full details of the impact by government department and agency on this White House site. In the private sector, managers are constantly pressed to review their operations and teams with an eye toward keeping expenses as low and productivity as high as possible. Few people believe they can rely lifetime employment with the same employer any more. Government jobs have been seen as offering more security. Most public sector employees won’t get rich from their wages, but many have pension plans, a benefit that has mostly departed the private sector. I’m sure that when these decisions were made, the analysis of who was essential was based on the risk to the public and what federal services were must have (safety, healthcare delivery) vs. nice to have (public parks). That being said, I hope the public employees themselves are made whole when this is over. 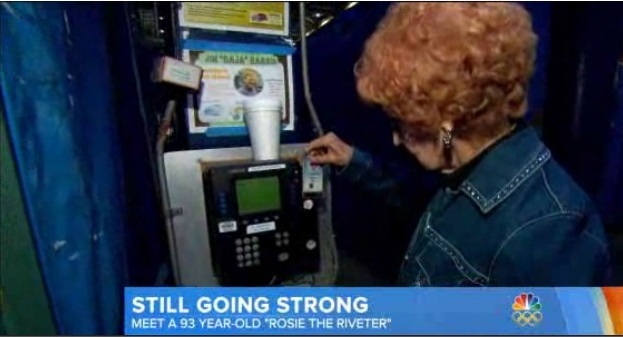 One essential private sector employee I’d like to applaud today is Elinor Otto, a 93 year-old Boeing employee shown above punching in on a Kronos time clock. Elinor says the secret to her healthy longevity has been to “just keep moving”. That sounds like good advice to the rest of us who would like to remain on that “essential” list. Watch the video below to see Elinor’s story. And then keep reading for more interesting items from the world of work.